I'm pretty sure that there isn't a person alive on this planet who didn't like the movies in the Toy Story series. And if there is, I'm not so sure I want to know! The Toy Story movies are touching, funny, thoughtful, and they appeal to adults and kids alike. 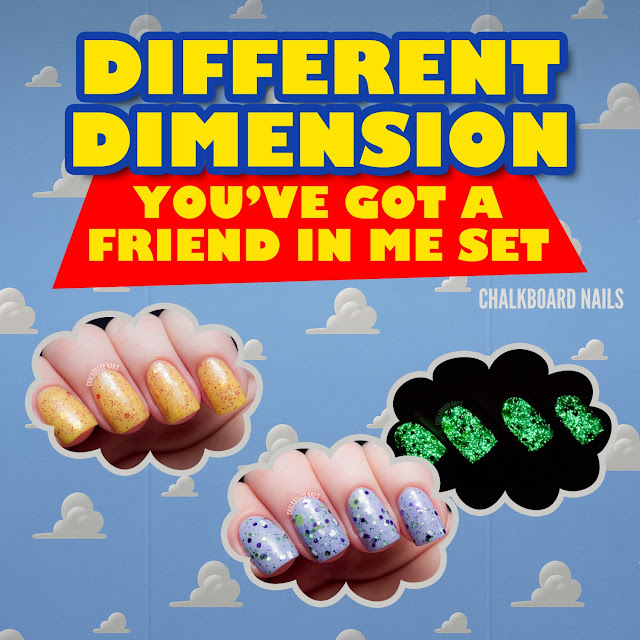 Today we're going to take a look at the Different Dimension You've Got a Friend In Me Set, a two-polish duo inspired by the movies. Reach For the Sky is a polish inspired by everyone's favorite toy cowboy - Woody! I remember when the first movie came out and my dad couldn't stop using "reach for the sky" as his own catchphrase. It's a yellow polish with yellow and red glitters, and it also seems to have some iridescent pieces. I used three coats for this swatch. ... IT GLOWS IN THE DARK! I love the inspiration for this set, and I think Missi totally nailed it. Each polish really reminds me of its character. These polishes are only available as a set, but you can pick them up in mini or full size versions via the Different Dimension Etsy shop. You can also keep up with the brand on Facebook, Twitter, & Instagram. If you are making a purchase, be sure to enter the code "CBN20" at checkout to receive 20% off! Love both of these, but Reach for the Sky is my favorite! 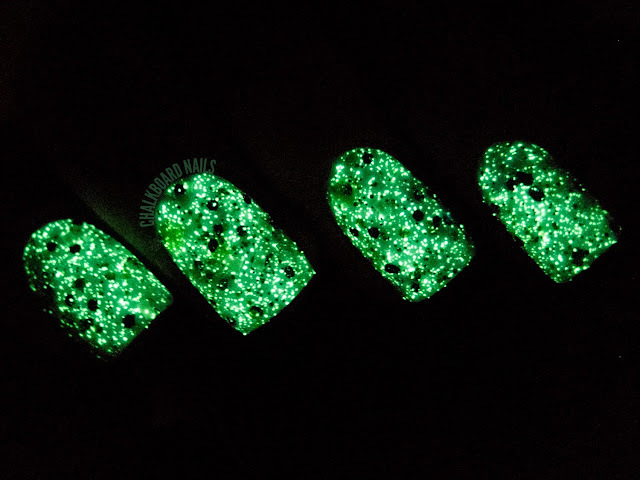 That glow in the dark ♥♥♥ gorgeous! The glow is just so superb!!! I was telling my sister she should buy these for me and I can wear the Buzz polish and she can wear the Woody one because those are our favourites respectively. She didn't go for it haha but I still rrally wany them. The Toy Story movies are my absolute favourites! Haha good plan! I'm sorry she didn't go for it! I just want to thank you- I was hemming and hawing over getting some DD polishes and then was reading your posts and saw the discount- I definitely have a friend indeed in you!! Great post!! I'm truly enjoying tthe design and layout of your blog.